Tunic has collar of green "leaves"
In one of the most beloved movies of all time, Willy Wonka & the Chocolate Factory, there’s an amazing scene in which the eccentric candymaker displays his newest invention: Lickable wallpaper! As the kids and their parents go to town on the tasty wall decor, the reclusive candy genius tells them, "Lick an orange. It tastes like an orange. The strawberries taste like strawberries! The snozzberries taste like snozzberries!”Which is hilarious, because what’s a snozzberry, right? What a funny word with no actual meaning! Except…there is a meaning, and according to the author of Willy Wonka, Roland Dahl, the book’s author, snozzberries are actually not so much a fanciful fruit as they are an important part of a male’s reproductive system! That’s right - you heard us! Which might surprise you, but when you realize that the story is basically about an insane recluse who just sort of casually murders a bunch of kids during a tour of his mysterious factory, it’s not so hard to believe that the author would have such a twisted sense of humor. 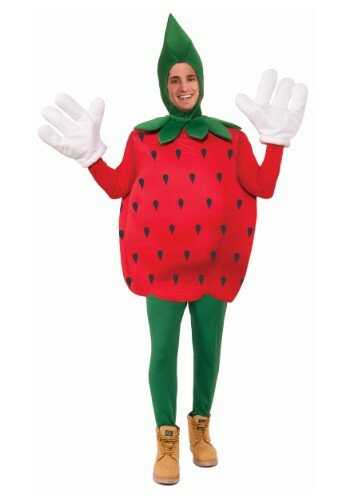 But if you’d prefer to be a more innocent, forthright part of the story but still attract some delicious attention, then this Adult Strawberry Costume is the perfect alternative to blowing people’s minds with salacious and shocking fun facts about their beloved children’s movies! Made of 100% polyester fabric and 100% polyurethane foam, this costume is comfortable while also maintaining it’s fresh, fruity shape. The foam-backed fabric sleeveless tunic has an all-over print of strawberry seeds, and sports a collar of green “leaves. The foam-backed fabric hood fastens under your chin with Velcro, keeping it secure yet comfy. Add a pair of green or red leggings or tights, and you'll ready to keep the fun fresh without getting dirty this Halloween!